It's time again for Secret Recipe Club (Secret Recipe Club) reveal! My blog assignment this month was Melissa's blog I Was born To cook. Born and raised in northern New Jersey, Melissa has always loved to cook, and she shares some great recipes on her blog. Her Black Bean Quinoa Salad and Turkey Barley Veggie Soup look really good. When the weather cools down a bit, I am making that soup! Eventually I decided on these Chocolate Zucchini Muffins for my Secret Recipe Club post. I wasn't able to have a garden this year, so I don't have any fresh zucchini, but thankfully I still have some in my freezer! Preheat oven to 350°. Lightly grease or line muffin tin with paper liners. In a large bowl, beat eggs. Beat in sugars and oil. Add the cocoa, vanilla, zucchini, and oatmeal and stir well. Stir the flour, baking soda, baking powder, salt, cinnamon, nutmeg, cloves and cardamom together. Mix into wet ingredients, just until moist. Pour batter into prepared muffin tin, filling 2/3 of the way. Bake for 20 to 25 minutes. Remove from pan and let cool on a wire rack. Store loosely covered. 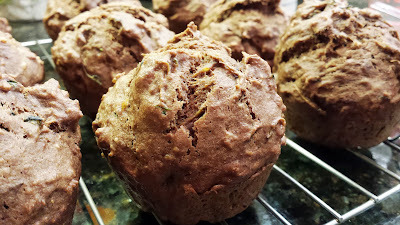 I cut the sugar down significantly in these muffins, because my Chocolate Zucchini Cake recipe calls for less sugar, and it's a cake. 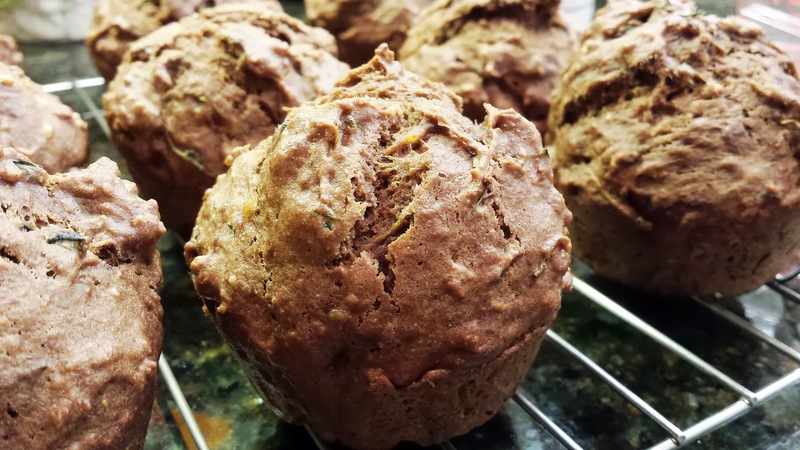 I also used whole wheat flour - 1 cup regular whole wheat and 1 cup white whole wheat - and added 1/2 cup oatmeal, because I like my muffins to be dense and filling. These definitely were! They needed just a touch of butter, and they were delicious! They don't look nearly as chocolatey as Melissa's, but they were chocolate; trust me. And the spices were perfect. 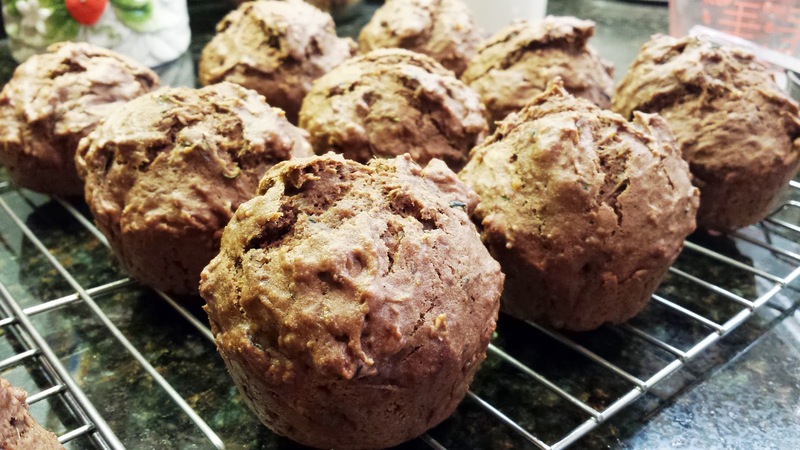 Melissa was hoping she could get some vegetables into her daughter Bella with these chocolate muffins - but Bella would have none of it, even though she's a chocolate lover. I had no problems with my adorable grandson Jason. He loved these! Of course, he loves green stuff, too, like green beans and peas.